My 4-year-old is at an age where she finds bodily functions and their associated sights, sounds and smells hilarious. Completely normal and, coming from a family where being proffered a finger to pull is perfectly acceptable, I’ve done nothing to discourage it. When the opportunity to review Galt Toys’ Horrible Science: Blood, Bones & Body Bits kit came up I knew she would be rubbing her hands together in gruesome glee. 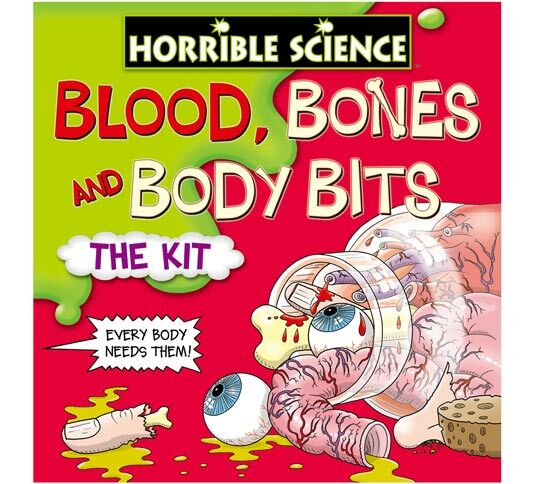 Blood, Bones & Body Bits is a collection of science experiments – “Horribly fantastic bodily experiments!” – in a box. Aimed at children 5 years and up, I knew it would mean a lot of participation on my part. But this is a good thing. Not only could I try to control the mess (in true over-bearing parent style), it also meant that it was going to be an educational experience for me. The ‘Lab Notebook’ accompanying the kit is excellent. It is informative, clear, funny and, best of all, I could make my 4-year-old believe I knew what I was talking about. I’m no scientist (I was afraid of Bunsen burners at school) but reading out the booklet – simplifying it in places if necessary – made me sound like Mrs Einstein. The ‘Horrible Science’ style of the booklet would be a great read for older children. Unfortunately, much of the humour was lost on my daughter but it certainly made it more digestible (excuse the bodily pun) for me. Brains – runnier than I expected. To avoid disappointment, check which of the experiments need leaving overnight before you promise instant ‘Rubber Bones’ or ‘Amazing Real-Size Brain’. And before you start an experiment it’s a must to check you have all the necessaries. The kit provides most of the equipment you need and anything extra can generally be found around the house (vinegar, bicarbonate of soda and such like). But do check. 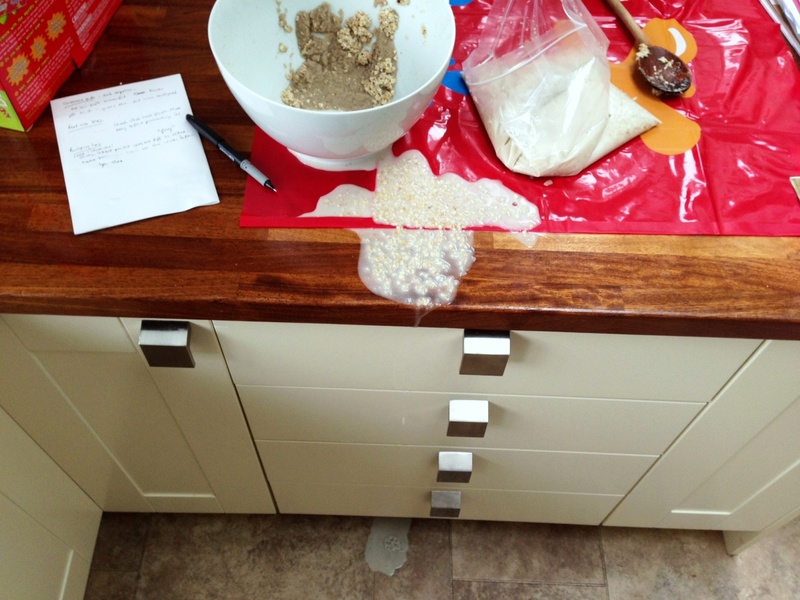 Turns out rolled porridge oats aren’t as effective as instant oats when you’re trying to recreate grey matter. Who would’ve thought? Ahem. Not every experiment worked for us. 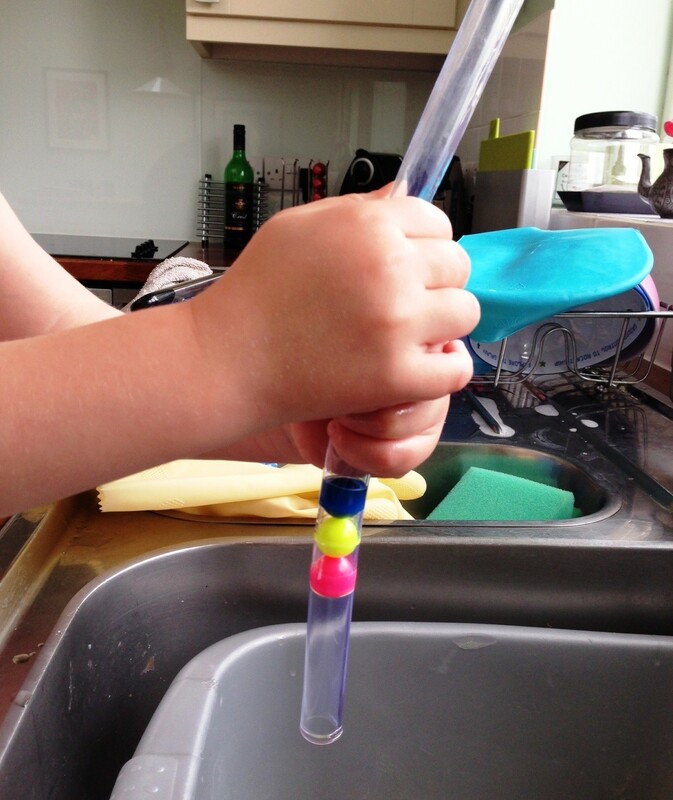 Trying to squeeze beads through a lubricated plastic tube to demonstrate the digestive process was more a lesson in constipation – not quite the intended result but educational nonetheless! There was some trial and error on mummy’s part trying to make the balloon function as a ‘Bottom-Burp Machine’ but my daughter won’t forget the effect of adding “just a little bit more” vinegar to bicarbonate of soda. Boom! A good lesson in how experiments are not about always getting it right first time – with science mistakes can lead to discoveries. Squeezing out a poo. Or not, in this case. Thank you to the lovely people at Galt Toys who sent this product to me free of charge and expected nothing in return other than an objective review. Horrible Science: Blood, Bones & Body Bits retails at around £15.99. Ah. You’d have thought I’d pulled a lump of coal and a rotten carrot out of the box. 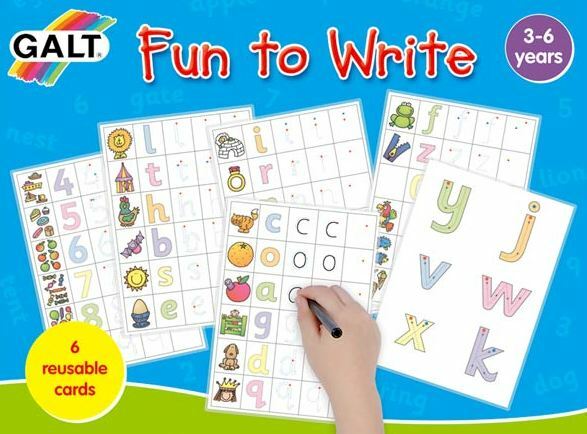 What I had produced, kindly sent by the people at Galt Toys, was Fun to Write, described on the box as a “simple and enjoyable method of letter and number forming … to encourage young children to develop basic writing skills”. I suspect my daughter queried in her mind how such a thing could possibly be fun. 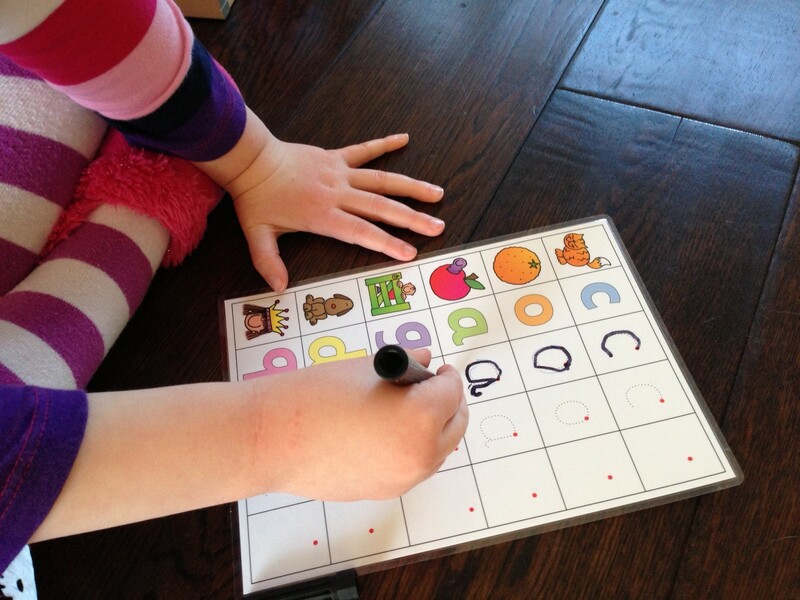 Aimed at 3-6-year-olds first starting to write, Fun to Write consists of 6 double-sided writing cards (wipe clean and so reusable) plus pen, pencil, notepad and some really helpful instructions on how to best use the product. Each card covers a selection of letters or numbers (with an illustrative picture for each), breaking the process of writing into three stages. First, trace the dots and follow the directional arrows. Next, the arrows are gone and your little Shakespeare has just the dots to follow. Finally – and here is where your budding scribe gets the opportunity to really shine – all that remains is a dot to indicate the starting point of the strokes. Cue some back patting of your pre-schooler (or at least some back patting through gritted teeth when, at stage 3, they insist on writing all the letters backwards). The lined notepad and pencil are presumably added to the pack to use when your child can go freestyle and leave the comfort of the wipe-clean cards. Most people have paper at home but a nice addition to the pack anyhow. Back to the 4-year-old guinea pig. My daughter is the oldest in her nursery class and is more than ready for school in September. As hard as nursery tries, they don’t have the resource to spend much one-to-one time with her developing her writing and reading skills. Likewise, although I’m a well-intentioned mother, I’m also a part-time working mum and have a busy little nearly-2-year-old to deal with so any props that can help me help my daughter enjoy some ‘educational time’ needn’t knock twice on my front door. “Just give her some paper and a pen!” I hear you cry. Unfortunately, with expectations driven by relentless toy advertising, the humble pen and paper sometimes just don’t cut the mustard with my little princess. Following the disappointment when I opened the parcel and explained what her surprise was, I didn’t have high hopes for Fun to Write in the Crumbs & Pegs household. Yet, to my surprise, she agreed immediately to have a go and soon completed one of the cards, asking me then to wipe it clean before she proceeded, unprompted, to tackle the reverse side. She’s always had a fascination with anything wipe-clean so I suspect this was a contributing factor in grabbing her attention. However, I think the 3-stage process of writing that the cards set out genuinely gave her a sense of achievement as she moved from stage to stage. The test will be whether her enthusiasm is still there when I next suggest getting the cards out or whether she will have seen through my ploy to get her to spend time on something that doesn’t involve a remote control. There’s a lot to be said for using the novelty factor to get kids to do things that might ordinarily seem a chore and for that reason I’m confident that the Fun to Write pack will get some regular use. As one of my favourite parenting gurus once said: “A spoonful of sugar helps the medicine go down”. Thank you to the lovely people at Galt Toys who sent this product to me free of charge and expected nothing in return other than an objective review. Fun to Write retails at around £6.99.